Loi Krathong[a] (Thai: ลอยกระทง, pronounced [lɔ̄ːj krā.tʰōŋ]) is a Siamese festival celebrated annually throughout the Kingdom of Thailand and in nearby countries with significant southwestern Tai cultures (Laos, Shan, Mon, Tanintharyi, Kelantan, Kedah and Xishuangbanna). The name could be translated as "to float a basket," and comes from the tradition of making krathong or buoyant, decorated baskets, which are then floated on a river. Loi Krathong takes place on the evening of the full moon of the 12th month in the traditional Thai lunar calendar, thus the exact date of the festival changes every year. In the Western calendar this usually falls in the month of November. In Chang Mai, the festival lasts three days, and in 2018, the dates will be 21–23 November. In Thailand, the festival is known as "Loi Krathong" (ลอยกระทง). Outside Thailand, this festival is celebrated under different names, including Myanmar as the "Tazaungdaing festival", Sri Lanka as "Il Full Moon Poya" and Cambodia as "Bon Om Touk". According to the Royal Institute Dictionary 1999, loi (ลอย) means "to float", while krathong (กระทง) has various meanings, one of which is "a small container made of leaves which can be floated on water during the Loi Krathong festival". Krathong is traditionally a small leaf container which is made to hold a small portion of goods like a traditional Thai dish (such as "Hor Mok") or dessert. The traditional krathong used for floating at the festival are made from a slice of a banana tree trunk or a spider lily plant. Modern krathongs are more often made of bread or Styrofoam. A bread krathong will disintegrate after a few days and can be eaten by fish. Banana stalk krathong are also biodegradable, but Styrofoam krathongs are sometimes banned, as they pollute the rivers and may take years to decompose. A krathong is decorated with elaborately-folded banana leaves, three incense sticks, and a candle. A small coin is sometimes included as an offering to the river spirits. 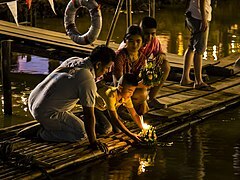 On the night of the full moon, Thais launch their krathong on a river, canal or a pond, making a wish as they do so. The festival may originate from an ancient rural ritual paying respect to the water spirits. The floats are thought to have been introduced to Chiang Mai in 1947 and have since been incorporated into local culture. Government offices, corporations, and other organizations launch large decorated krathongs. There are competitions for the best of these large krathongs. A beauty contest is a regular feature and fireworks have become common in recent years. Loi Krathong is often claimed to have begun in the Sukhothai by a court lady named Nopphamat. However, it is now known that the Nopphamat tale comes from a poem written in the early Bangkok period. According to King Rama IV, writing in 1863, it was a Brahmanical festival that was adapted by Thai Buddhists in Thailand to honor the Buddha, Prince Siddhartha Gautama. The candle venerates the Buddha with light, while the krathong's floating symbolizes letting go of all one's hatred, anger, and defilements. People sometimes cut their fingernails or hair and place the clippings on the krathong as a symbol of letting go of past transgressions and negative thoughts. Many Thais use the krathong to thank the Goddess of Water, the Hindu Goddess Ganga, Phra Mae Khongkha (Thai: พระแม่คงคา). The beauty contests that accompany the festival are known as "Nopphamat Queen Contests". According to legend, Nang Nopphamat (Thai: นางนพมาศ; alternatively spelled as "Noppamas" or "Nopamas") was a consort of the 13th century Sukhothai king Sri Indraditya (who is also known as Phra Ruang) and she had been the first to float a decorated raft. However, this is a new story which was invented during the first part of the 19th century. There is no evidence that a Nang Nopphamat ever existed. Instead, it is a matter of fact that a woman of this name was the leading character of a novel released at the end of the reign of King Rama III, around 1850 CE. Her character was written as guidance for all women who wished to become civil servants. Kelantan in Malaysia celebrates Loi Krathong similarly, especially in the Tumpat area. The ministry in charge of tourism in Malaysia recognises it as an attraction for tourists. Many people visit the celebration each year. Loi Krathong coincides with the Lanna (northern Thai) festival known as Yi Peng (Thai: ยี่เป็ง). Yi means 'two' and peng means a 'full moon day'. Yi Peng refers to the full moon day in the second month according to the Lanna lunar calendar (the twelfth month of the Thai lunar calendar). The festival is meant as a time to make merit (Thai: ทำบุญ; RTGS: tham bun). 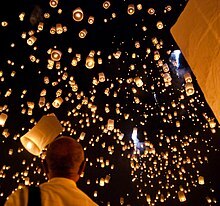 Swarms of sky lanterns (Thai: โคมลอย; RTGS: khom loi), literally: 'floating lanterns', are launched into the air. Khom loi are made from a thin fabric, such as rice paper, stretched over a bamboo or wire frame, to which a candle or fuel cell is attached. When the fuel cell is lit, the resulting hot air is trapped inside the lantern and creates enough lift for the khom loi to float into the sky. According to the Bangkok Post, the association of lanterns with the November festivities is a relatively recent phenomenon, dating back to the first decade of the 21st century, when introduced by local tourism authorities. Because they are a hazard to passing aircraft and "...can cause damage to important places in the areas such as the Grand Palace [sic], temples and governmental offices,..." khom loi are increasingly subject to governmental restrictions. In Chiang Mai, authorities cancelled 78 flights in and out of Chiang Mai Airport on 3–4 November 2017. Another 79 flights were rescheduled. Despite those measures, the remains of more than 100 lanterns were later found on airport premises. In Bangkok, the public are prohibited from using fireworks and sky lanterns entirely. Violators may face three years imprisonment and/or a fine of 60,000 baht. One hundred-ninety piers on the Chao Phraya River will be open to the public to float their krathongs. In 2018, up to 158 flights were cancelled or rescheduled at three airports, and in Bangkok 88 piers were closed. During the festival, some people also decorate their houses, gardens, and temples with khom fai (Thai: โคมไฟ), intricately shaped paper lanterns which take on different forms. Khom thue (Thai: โคมถือ) are lanterns which are carried around hanging from a stick, khom khwaen (Thai: โคมแขวน) are the hanging lanterns, and khom pariwat (Thai: โคมปริวรรต), which are placed at temples and which revolve due to the heat of the candle inside. The most elaborate Yi Peng celebrations can be seen in Chiang Mai, the ancient capital of the former Lanna kingdom, where now both Loi Krathong and Yi Peng are celebrated at the same time resulting in lights floating on the waters, lights hanging from trees/buildings or standing on walls, and lights floating in the sky. The tradition of Yi Peng was also adopted by certain parts of Laos during the 16th century. In 2016, the Bangkok Metropolitan Administration (BMA) cleaned six tonnes of rubbish from the city's waterways on the day after Loi Krathong. The city governor said that 661,935 floats were collected from waterways across Bangkok. Of these, 617,901 (93.7 percent) were made of decomposible natural materials, while 44,034 were non-biodegradable Styrofoam floats. There were 163,679 fewer krathong collected than in 2015. The city mobilized 210 workers and 45 boats to collect floats from the Chao Phraya River and canals. In Nakhon Ratchasima, 50 workers collected krathong from the moat in the town centre near the Thao Suranaree Monument. In Buriram, more than 200 workers and volunteers in Mueang District cleared at least 20,000 krathong from the town's moat. There, Styrofoam krathong will be banned in 2017. In Lampang, more than 100 students and teachers from the Institute of Physical Education helped municipal workers clean up the Wang River in Mueang District. In 2018, after the festivities, Bangkok city workers cleared 841,327 krathongs, up from 3.6 percent in 2017, from the Chao Phraya River, local canals, and 30 public parks; 5.3 percent of them were made from styrofoam. Partially made krathong, showing trunk of banana tree and banana leaves. ^ Alternative spellings include Loy Krathong, Loi Kratong, Loy Gratong, etc. ^ "The Penguin Handbook of the World's Living Religions". Penguin UK. 25 March 2010 – via Google Books. ^ "Buddhist Calendar - Southeast Asian Calendars - Thai Calendar". ^ "Pictures of the day: 23 October 2016". ^ "Il Poya". 12 September 2014. ^ "พจนานุกรม ฉบับราชบัณฑิตยสถาน พ.ศ. 2542" [Royal Institute Dictionary 1999] (in Thai). Royal Institute of Thailand. 2007. Archived from the original on 2009-03-03. Retrieved 2014-06-06. ^ Chadchaidee, Thanapol "Lamduan" (2013). "Loy Krathong Festival". Essays on Thailand. Booksmango. pp. 5–7. ^ a b c "No urban place for Loy Krathong" (Opinion). Bangkok Post. 18 November 2018. Retrieved 18 November 2018. ^ สาระน่ารู้เกี่ยวกับประเพณียี่เป็งล้านนา [Info about Lanna's Yi Peng] (in Thai). Chiang Rai Provincial Culture Office. 2004. Archived from the original on 2014-04-10. Retrieved 2014-06-06. ^ Atthakor, Ploenpote (1 November 2017). "Loy Krathong must be kept under control". Bangkok Post. Retrieved 1 November 2017. ^ "Police and City Hall say no fireworks, firecrackers or sky lanterns on Loy Krathong Day". Thai PBS. 30 October 2017. Retrieved 31 October 2017. ^ "Up to 158 flights cancelled amid air safety fears". Bangkok Post. 22 November 2018. Retrieved 22 November 2018. ^ "Lantern Festival of the Yee Peng Month". Archived from the original on 2013-02-28. ^ a b "City cleans 6 tonnes of krathong waste". Bangkok Post. 16 November 2016. Retrieved 16 November 2016. ^ "Styrofoam krathong numbers sink". Bangkok Post. 2018-11-24. Retrieved 2018-11-24. Wikimedia Commons has media related to Loi Krathong. Suttinee Yavaprapas; Chaleo Manilerd; Thailand. Krasūang Watthanatham. External Relations Division; Thailand. Krasūang Watthanatham. Office of the Permanent Secretary (2004). Loy Krathong Festival. Ministry of Culture, External Relations Division. ISBN 978-974-9681-22-0. Retrieved 5 October 2011. Donald K. Swearer (1 February 2010). The Buddhist world of Southeast Asia. SUNY Press. pp. 49–. ISBN 978-1-4384-3251-9. Retrieved 5 October 2011. Anuman Rajadhon (Phrayā) (1956). Loy krathong & Songkran festival. National Culture Institute. Retrieved 5 October 2011. The Kingdom of the Yellow Robe. Forgotten Books. pp. 358–367. ISBN 978-1-4400-9096-7. Retrieved 5 October 2011.